This is book 1 in the Covert Heiresses series. Vivian Loren wants revenge for the death of her brother. Knowing that it was not a robbery gone wrong like she was told, she will do anything to find out the truth. When told to spy on the Duke of Abermont in exchange for answers, she jumps at the chance. 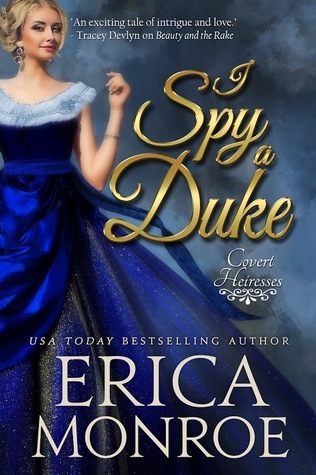 Now in the employee of the duke, Vivian searches for evidence of him betraying the country. James Spencer, the Duke of Abermont, is the head of Britain's elite intelligence agency. When he finally gets the truth from Vivian, after her life is threatened, he sees an answer to both of their problems. He needs a wife and she needs protection. Vivian will become his duchess and he will do everything in his and the agency's power to protect her. Can a marriage of convenience turn into the love of a lifetime? I loved this story and can't wait for the rest of the series! Monroe is masterful at weaving in a convincing mystery within the love story. I just love when you have some straight-laced or never-do-good lord that ends up being a spy and is just hiding his true personality! It is rarer to have the spy be the heroine of the story, but I think the other stories in this series will have a few and I can't wait! Thanks go out to Quillfire Publishing via NetGalley for a copy of the book in exchange of an honest review.